When Evelyn Morgan walked into the village bookstore, she didnt know she would meet the love of her life. 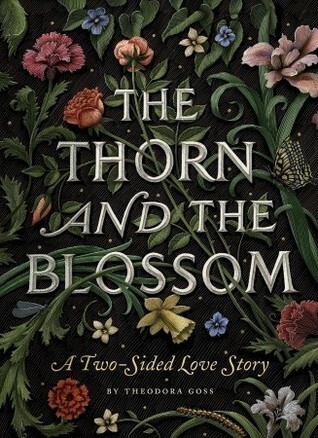 When Brendan Thorne handed her a medieval romance, he didnt know it would change the course of his future. It was almost as if they were the cursed lovers in the old book itself . . .
Evelyn and Brendan meet in the picturesque Cornish town of Clews and a tentative romance begins to bloom. Just when things are getting started, Evelyn is unsettled by an experience in the woods and the two drift apart. Ten years later, they meet up again, but can they make it work this time? First of all, this book has one of the most gorgeous covers I’ve ever seen. That’s one of the main reasons I checked this book out from the library, but I also thought that it sounded really interesting (and I love second chance romances). Unfortunately, the book was very disappointing. I think the biggest problem is that the book is too short. At 82 pages, it’s a reasonably-sized novella. The thing is, it’s really only 40 or so pages because the book is half Evelyn’s version of events and half Brendan’s. And this would be fine if either side expounded any more on events, but they don’t. I just wanted something more. The idea of the book is wonderful, but it’s not the kind of story that can be told well in 40 pages. I’d expected some sort of twist at the end, but there’s really nothing there. The book kind of just ends and when I finished, I felt that I was missing something.